In this tutorial, you will lean a quick way to calculate percentages in Excel, find the basic percentage formula and a few more formulas for calculating percentage increase, percent of total and more. Calculating percentage is useful in many areas of life, whether it is restaurant tipping, reseller commission, your income tax or interest rate. Say, you've been lucky enough to get a 25% off promotion code on a new plasma TV. Is this a good deal? And how much will you eventually have to pay? In this tutorial, we are going to explore a few techniques that will help you efficiently calculate percent in Excel and learn the basic percentage formulas that will take the guesswork out of your calculations. The term "per cent" is derived from the Latin per centum, meaning "by the hundred". As you probably remember from high school math class, a percentage is a fraction of 100 that is calculated by dividing the numerator by the denominator and multiplying the result by 100. This is how you normally calculate percentages in school and everyday life. Computing percentage in Microsoft Excel is even easier since Excel performs some operations for you automatically, in the background. Regrettably, there is no universal Excel formula for percentage that would cover all possible scenarios. If you ask someone "Which percent formula do I use to get the result I want? ", most likely, you will get an answer like "Well, that depends on what exactly result you want to achieve." So, let me show you a few simple formulas for calculating a percent in Excel such as a percentage increase formula, a formula to get percentages of a total and more. If you compare it to the basic math formula for percentage, you will notice that Excel's percentage formula lacks the *100 part. 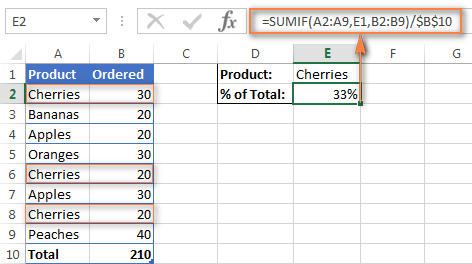 When calculating a percent in Excel, you do not have to multiply the resulting fraction by 100 since Excel does this automatically when the percentage format is applied to a cell. 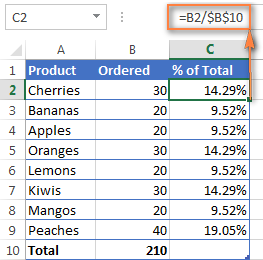 Enter the formula =C2/B2 in cell D2, and copy it down to as many rows as you need. Click the Percent Style button (Home tab > Number group) to display the resulting decimal fractions as percentages. Remember to increase the number of decimal places if needed, as explained in Percentage tips. The same sequence of steps shall be performed when using any other percentage formula in Excel. In the following example, column D displays a rounded percent of delivered items, without any decimal places showing. In fact, the above example is a particular case of calculating percentages of a total. Now, let's investigate a few more examples that will help you make quick work of calculating a percent of a total in Excel on different data sets. A very common scenario is when you have a total in a single cell at the end of a table. 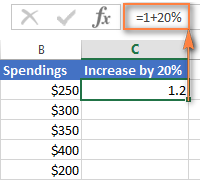 In this case, the percentage formula will be similar to the one we've just discussed with the only difference that a cell reference in the denominator is an absolute reference (with $).The dollar sign fixes the reference to a given cell, so that it never changes no matter where the formula is copied. You use a relative cell reference to cell B2 because you want it to get changed when you copy the formula to other cells of column B. But you enter $B$10 as an absolute cell reference because you want to leave the denominator fixed on B10 when auto-filling the formula down to row 9. Tip. To make the denominator an absolute reference, either type the dollar sign ($) manually or click the cell reference in the formula bar and press F4. The screenshot below demonstrates the results returned by the formula, the Percentages of Total column is formatted as percentage with 2 decimal places showing. In the above example, suppose you have several rows for the same product and you want to know what part of the total is made by all orders of that particular product. 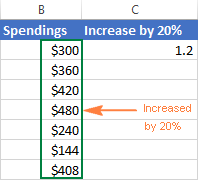 Of all formulas for calculating percentage in Excel, a percent change formula is probably the one you would use most often. When applying this formula to real data, it is important that you correctly determine which value is A and which is B. For example, yesterday you had 80 apples and how you have 100, meaning that now you have 20 apples more than before, which is 25% increase. If you had 100 apples and now you have 80, your number of apples has reduced by 20, which is 20% decrease. 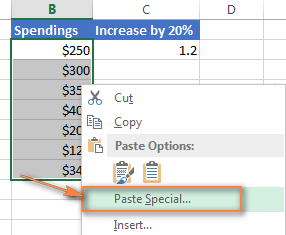 And now, let's see how you can use this percentage change formula (aka Excel percentage increase formula) in your spreadsheets. This percent change formula calculates the percentage increase / decrease in this month (column C) comparted to last month (column B). After copying the formula to other rows, remember to click the Percent Style button on the ribbon to display decimals as percentages and you will get a result similar to what you see in the screenshot below. In this example, positive percentages that show percentage increase are formatted in usual black, while the negative percentages (percent decrease) are formatted in red by using the technique explained in this tip. Where C2 is the 1st and C3 is the 2nd cell with data. Note. 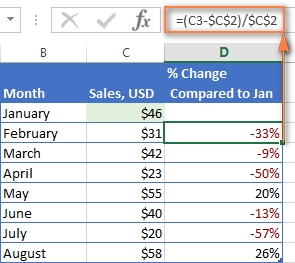 Please pay attention that you should skip the first row with data and put your Excel percentage formula into the 2nd cell, which is D3 in this example. 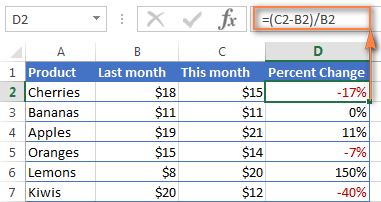 If you want to calculate percentage change compared to a certain cell, then you need to fix the reference to that cell by using the absolute cell reference with the $ sign, e.g. $C$2. 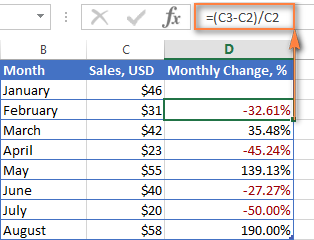 When you drag the formula down to copy it to other cells, the absolute reference ($C$2) will stay the same, while the relative reference (C3) will change to C4, C5 and so on. 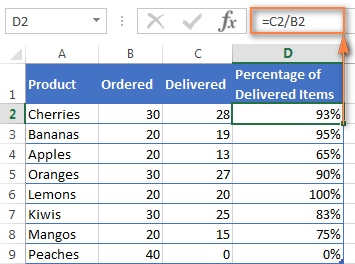 As you've just seen, calculating percentages in Excel is easy, and so is calculating amounts and totals if you know the percentage. Suppose you are buying a new laptop for $950 and they charge 11% VAT on this purchase. The question is - how much do you have to pay on top of the net price? In other words, what is 11% of $950? Assuming that the total value is in cell A2 and percent in B2, the above formula turns into a simple =A2*B2 and returns 104.50. Remember, when you type a number followed by the percent sign (%) in Excel, the number is interpreted as a hundredth of its value. For example, 11% is actually stored as 0.11 and Excel uses this underlying value in all formulas and calculations. In other words, the formula =A2*11% is equivalent to =A2*0.11. Naturally, you are free to use the decimal number corresponding to the percentage directly in a formula if this works better for your worksheets. For example, you friend offered you his old computer for $400, which is 30% off the original price. You want to know what the original price was. Since 30% is the discount, you deduct it from 100% first to know what percentage you actually have to pay (100% - 30% = 70%). Now you need the formula to calculate the original price, i.e. to find the number whose 70% equals 400. The holiday season is upon us and this indicates a change in your usual weekly spendings. You may want to consider different options to find out your optimum weekly allowance. For example, the formula =A1*(1+20%) increases the value in cell A1 by 20%. For instance, the formula =A1*(1-20%) reduces the value in cell A1 by 20%. Suppose, you have a column of numbers that you want to increase or reduce by a certain percent, and you want to have the updated numbers in the same column rather than add a new column with the formula. Enter all the numbers you want to increase or decrease in some column, column B in this example. Naturally, you are free to replace 20% in the above formulas with the percentage you want. 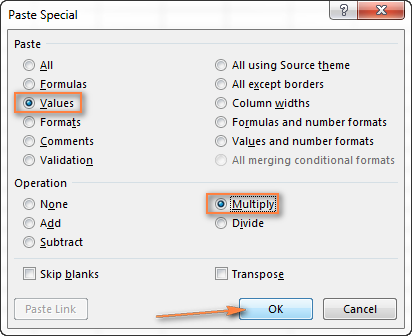 Select the cell with the formula (C2 in our case) and copy it by pressing Ctrl + C.
In the Paste Special dialog window, select Values under Paste, Multiply under Operation and click OK. In the same fashion, you can multiply or divide a column of numbers by a certain percentage. Simply enter the desired percentage in an empty cell and follow the steps above. This is how you calculate percentage in Excel. And even if working with percentages has never been your favorite kind of math, by using these basic percentage formulas you can get Excel to do the work for you. That's all for today, thank you for reading! 391 Responses to "How to calculate percentage in Excel - formula examples"
I need to work out what percentage of people achieved a certain result range. For example, how many of a percentage achieved 99-99.90 and next group 98-98.95. Formula is explained in detail and am appreciation indeed. and in future will hope full to find more solution about excel.